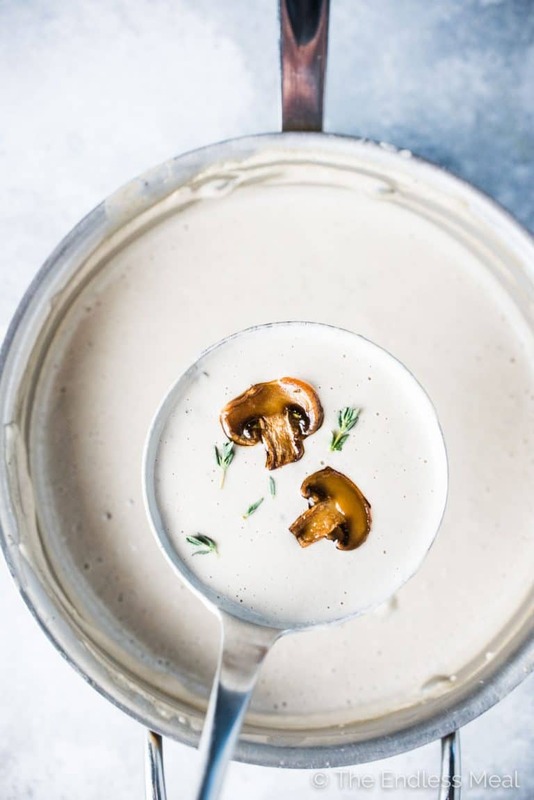 Cashew Cream of Mushroom Soup tastes like it's loaded with cream, but it's 100% dairy-free. It's an easy to make soup recipe that's healthy enough for a clean eating detox but won't leave you feeling like you're missing out. Campbell's Cream of Mushroom Soup coming atcha! Juuuust joking. I would never do that to you guys. Could you even imagine? Ha! But hey, we're adults now and we can fancy it up. Or not. 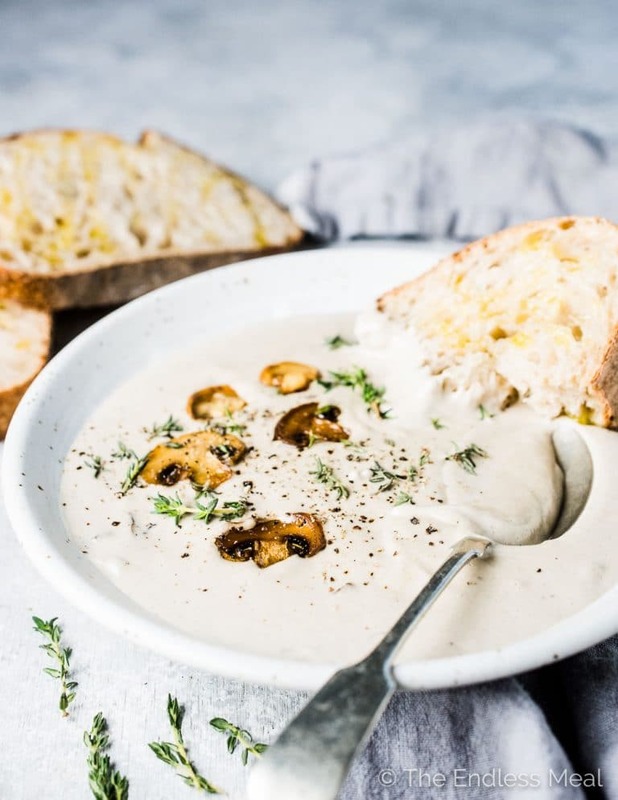 That's the thing about this Cashew Cream of Mushroom Soup, it can be whatever you want it to be. ♡ Fav childhood soup – checkmark. ♡ Pretty dinner party starter – you got it. ♡ Weeknight I need dinner now – 20 mins and this bowl of soup is yours. See those cashews and sweetly sauteed onions and mushrooms up there in the blender? They're about to become your Cashew Cream of Mushroom Soup. And you, my friend, are about to become one happy camper. It is everything creamy and mushroomy and delicious. It is healthy. But honestly, guys, let's move that down to the bottom of the list and focus on the real reasons you need this soup. All your childhood lunch dreams blended up into one magic soup. Make doubles. Fancy it up tonight with sprinkles of mushrooms and thyme and serve it to your besties with glasses of chilled wine and lots of good conversation. Warm up the leftovers tomorrow and eat them in your sweatpants on the couch while binge watching Netflix. Be a badass domestic goddess and meal prep this soup on Sunday and have days of killer lunches. It is so creamy and mushroomy. Yes, it's worth mentioning that twice. 1 Put some raw cashews in a jar and fill the jar with water. Pop the jar in your fridge. 2. Saute some mushrooms, onions, and garlic until everything is nicely browned. Season them with some sea salt, black pepper, and a little thyme. 3. Put those cashews you were soaking into your blender. Add the mushrooms and onions and a little water and blend those babies until they're creamy and smooth. 4. Pour your soup back into the pot, add enough water so it's just how thick you like it. Heat it up and you're done. See how crazy easy that was? 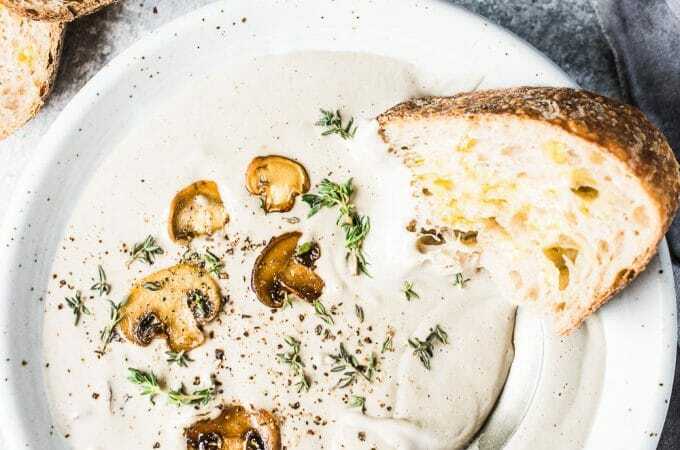 If you love this Cashew Cream of Mushroom Soup as much as I do, make sure to give it a 5-star rating in the comments below! Heat the olive oil in a large non-stick frying pan over high heat. Cook the mushrooms until they have released their liquid and are just starting to brown, about 10 minutes. Reduce the heat to medium-high, add the onion and cook until it is soft and light brown, about 5 minutes. Add the garlic, sea salt, thyme, and black pepper and cook for 1 minute more. Transfer the mushrooms to your blender. 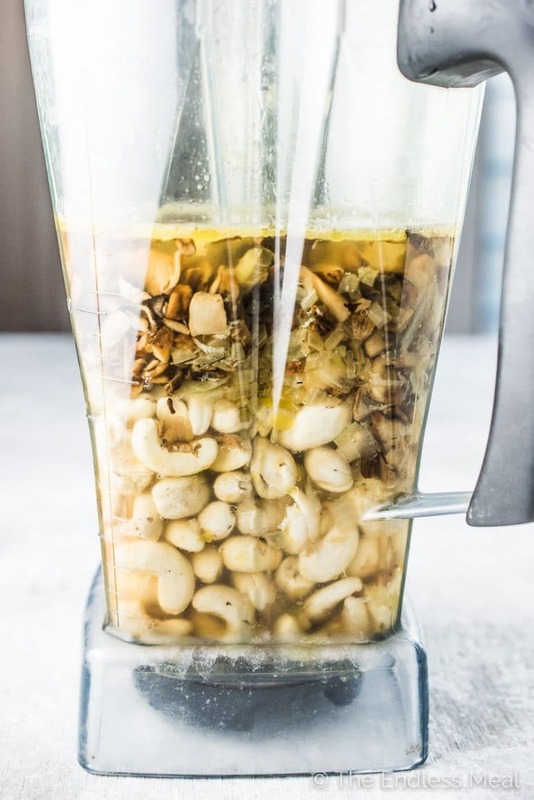 Drain and rinse the cashews and put them in your blender. Add 3 cups of water and blend on high until very smooth. Pour your soup back into the pot, add one more cup of water and reheat it gently. Season to taste with extra sea salt and black pepper. While I do love serving this soup with bread, if you follow a Whole30 or paleo diet you will need to eat on its own. If you want to get extra fancy, a little drizzle of truffle oil is amazing. I use this cream of mushroom recipeI to make pasta con’ broccoli. We love it, and it please my daughter’s vegan stomach. I noticed this soup has a high sodium content. If I don’t add salt will that lower the content considerably. Otherwise, looks like an amazing recipe and I would like to try it. I loved the flavor of this soup but the dull grey color of it was a real turn off. How do you get it to look whiter? I used white mushrooms. I am so thankful you shared this recipe! My husband loves it and I’m sure I am going to fake out my family with the green bean casserole I plan to use this in. I’m vegetarian but cannot eat dairy. My daughter is Vegan. My father is allergic to almonds. So many people to please and this recipe is wonderful. It turned out thick and creamy and extremely satisfying! That’s so fantastic! It’s so great when everyone at the table is happy!! Very sweet from the cashews and if I put salt it just seemed like two flavors fighting. The texture on my soup didn’t look as creamy as yours, in fact mine was grainy. Any advice? Looks Yummy and Delicious mushroom soup recipe, will try it soon! I thought I would never be able to eat cream of mushroom soup again but thanks to your recipe I can. I followed the recipe exactly and it’s perfect! That makes me so happy to hear! Hooray! Yum! I’m enjoying this for supper right now with some warm, buttered bread. 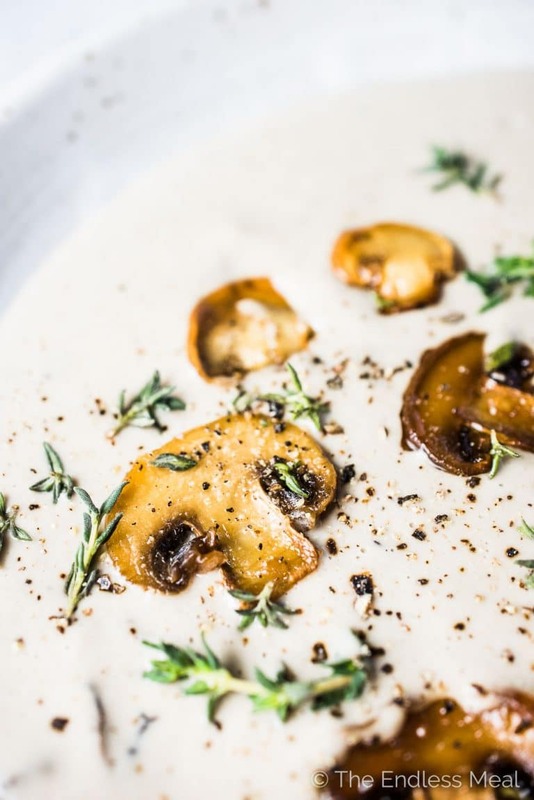 I’ve made soup out of your magic mushroom sauce before – but I love this recipe with the thyme. Thanks! I love that you beat me to making soup out of the magic mushroom sauce! Great minds think alike! This looks stellar! I never actually grew up eating a lot of white creamy soups aside from clam chowder. I do love a good creamy and hearty soup, especially one with lots of vegetables, and mushrooms are a favorite of mine! Me too! I’m sure it’s why I love cream-based soups now. While I’ll order them when I eat out, I can’t bring myself to make them at home. I love coming up with healthy ways to mimic my fav unhealthy recipes!